Considered by some as pioneers of the "power pop" genre, Badfinger's star was blessed by no less than the Beatles, who signed them to their Apple label, and Paul McCartney wrote and produced their first single, "Come and Get It." 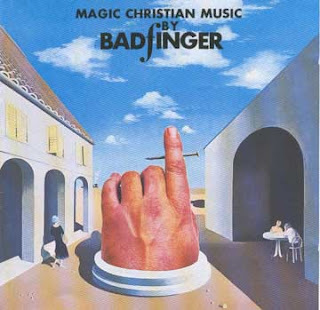 Badfinger's story has been told in many places -- four huge hit singles in the early 70's, loved by critics, but not selling enough albums, eventually signed by Warner Brothers, and then ending in the suicide of two its four members a year apart. I'm not going to review the sad tale, which can be read about here on the BBC's web site. Eric, who drives me to the airport for business trips, has been been urging me for a while to rent The Magic Christian, the film where "Come and Get It" made its debut. Starring Peter Sellers and Ringo Starr, the British film was never a hit and has been really a cult item, apparently still available on DVD. For Eric's sake, I'll probably have to indulge it on Netflix. 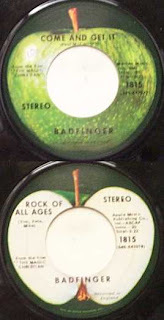 Badfinger, originally called The Ivies, was signed to Apple Records and were practically given their marching orders to record "Come and Get It" as their first single, and as the story goers, exactly like Paul McCartney's demo, which can be heard on the Beatles Anthology collection as well as the video below this post. "Come And Get It," while being a typical McCartney toss-off of endearing melody and lightweight lyrics, was a prophetic blueprint of hits to come. Guitarist/keyboard player Pete Ham and bassist Tom Evans both wrote many fine pop rock songs, a few of which became very successful, and one of their compositions, "Without You," was re-recorded by Harry Nilson and became a #1 hit ballad. It was Badfinger's blessing to have that kind of talent that they did not have to rely on McCartney for more hits. Compositionally, this is another one of those short, very simple 4/4 songs that incorporates unusual chord progressions so effortlessly. The verses and choruses are your basic Eb-Ab-Bb variations, but then it zips right into B major to Ebm and then E major to Eb and Bb, which from a musical point of view, is sort of all over the place -- yet it works seamlessly here, harmonies and all. "Come and Get It" is one of those songs that when you hear it on the radio or CD player, you end up singing it to yourself many times long after the song concluded. Below are two cool videos, the first of Badfinger playing the song live on a TV show called "Beat Club" at the end of February 1970. What caught my eye were Tom Evans' big Fender bass, practically as big as a bazooka... drummer Mike Gibbons intense focus... and Pete Ham's deliberate methodical piano playing. Below that, somebody was nice enough to post McCartney's demo, slightly slower in tempo yet completely laid out in arrangement, down to the cymbal crashes and maracas, for Badfinger's version.